I photographed this beautiful Mississippi bride as she gazed out of the window, bathed in glorious light as the adorable flower girls looked on. Though there was a little bit of light rain in the area, it cleared up in time for us to do a first look before the ceremony, and some portraits of the bride and groom around the grounds in the beautiful afternoon light. 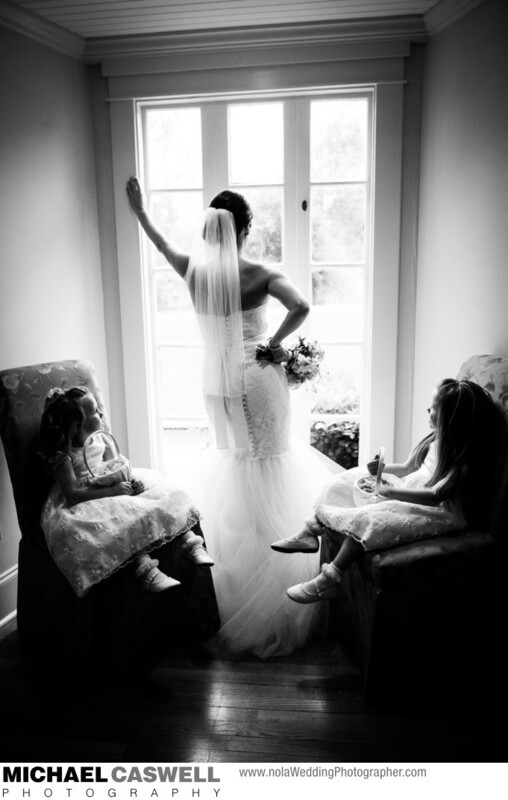 The wedding took place at the elegant Oak Crest Mansion Inn located in Pass Christian, Mississippi. This is a charming wedding venue that can accommodate outdoor and indoor ceremonies, and has a very nice and spacious reception space as well. The event was coordinated by A Plan To Remember.